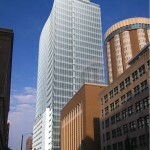 Godfrey & Kahn could soon anchor a 22-story class A office tower, known as Washington Square, in downtown Milwaukee. The project is being developed by a joint venture between Van Buren Management Inc. and Irgens Development Partners LLC, and would be located across the street from the Pfister on a surface parking lot currently owned by Joel Lee (of Van Buren Management). Designed by Rinka Chung Architecture the high-rise will include class A office space, first-floor retail, and multiple floors of structured parking. Also visible from the renderings is a skywalk connecting across Mason St. connecting to additional structured parking. 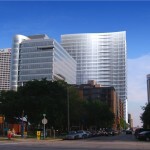 Although the renderings show a building of more than 22-stories, the number of stories will be determined by the development teams ability to land additional tenants for the building. I wish there was a little bit more color involved, especially since it is so close to Cathedral Place, but I am so glad they are using a surface lot for infill! Makes my urban planning heart sing! Now all we can hope for is a quick approval and construction. Rinka Chung has been put through the ringer enough with the Moderne! It will be a great addition to downtown proper. Looks promising! I’m glad the Class A building competition appears to be settled for now and something new can be added to East Town. Btw, that skywalk crosses Mason, not Wells. @Rob Thanks for the catch… doh! @Danny I’m sure there will be two big questions regarding this office tower. 1. Should the city really TIF a project that just moves tenants around. 2. Skywalk? Really? The firm’s name is Rinka Chung, not “Rink Chung”. @JJ McJJ Thanks typo on my part…. Whatever happened to this project? It’s still listed on the architect’s website. Is this the same building the NWM is putting up or is the NWM residential building a completely different project? @Casey I don’t know the status of Washington Square, but the NM residential building is a completely different project (basically kitty–corner across the street from where Washington Square would go).